Stanford University Case Study (Case E-424), for the Graduate School of Business - Deborah Perry Piscione (Finding Opportunity in Silicon Valley)"
Deborah Perry Piscione (bio) has uncovered how leaders are changing the mindsets of their companies and driving unprecedented innovation and growth as a result. Her intriguing work stems from the stark differences between old-school power and new school leadership. Having worked as an insider at the White House and Capitol Hill, and then moving into the center of Silicon Valley, Deborah was struck by the vast differences in mindsets between the two coasts. She became fascinated by the collaborative cultures of innovation that dominate the Silicon Valley region, especially the voracious appetite for growing value from ideas. Provocative and wonderfully entertaining, Deborah's presentations are a prerequisite for leaders looking to shake the status quo. We all understand how hard it is to change mindsets. Since human behavior can be unpredictable, we set policies and procedures to limit behavior and focus our energies on managing productivity and investing in technological solutions...leading to cultures that over-reward production and under-reward creativity, risk-taking, problem-solving, and a general passion for innovation and growth. In this breakthrough presentation Deborah Perry Piscione shows that every organization can develop new mindsets, organizational structures, and product development/ problem-solving processes that will maximize opportunities in the future. Using examples from the most admired organizations and from her research into world-class business practices, Piscione shows how to create a culture where risk-taking is rewarded, Mavericks are encouraged, collaboration is nurtured, and leadership unlocks the potential of it's workers. This is a truly inspiring and pragmatic presentation on harnessing the energy in every organization. In this keynote, speaker Deborah Perry Piscione explains how different parts of the ecosystem come together as an interconnected web, such as the collaborative dynamics between private and public sectors, the interplay between higher education and the business community and the commercialization of know-how. Piscione takes a close look at the spirit of entrepreneurialism, examining the six characteristics that all Silicon Valley entrepreneurs radiate -- passion, authenticity, love of ideas, an appetite for risk, trustworthiness, and resilience. You will find this an extremely enlightening and inspiring keynote. Our most revered business icons of the last few decades are the bold risk-takers, such as Richard Branson, Elon Musk, and Steve Jobs. Yet in today's stock market-driven economy, companies are playing it safe, with too many leaders focused on short-term gains, rather than value creation. The result is a static business culture that generates forgettable results―even as the world demands big solutions. So how do we get back in the risk-taking game? 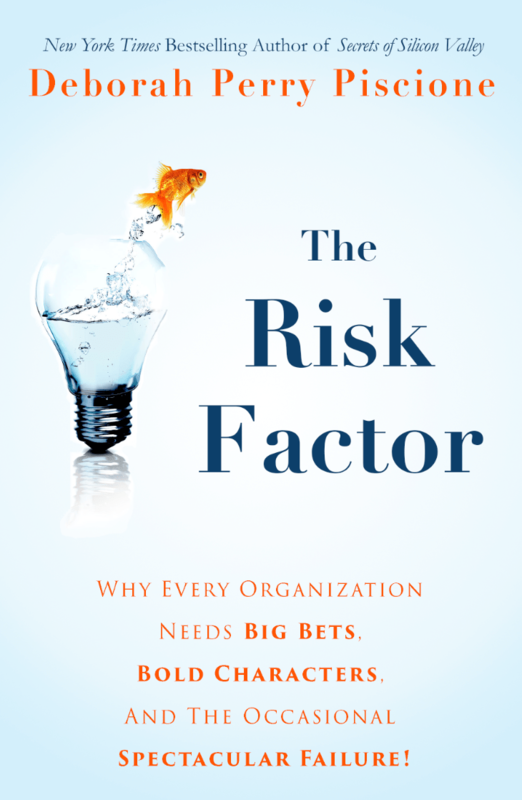 In The Risk Factor, Deborah Perry Piscione takes the most comprehensive look at this crucial, undervalued leadership behavior, and outlines how companies must support risk-taking across the enterprise. Exploring the heroes of risk, including entrepreneurs, venture capitalists, and technologists, and the role risk-taking and failure tolerance play in their success, she makes a compelling case not only for big, flashy mergers or acquisitions but also for unorthodox choices in everything from leadership to corporate social responsibility. Drawing on case studies from a wide range of now-famous giants (Netflix, Salesforce) and successful start-ups (Tesla, NetApp), she distills lessons for both new entrepreneurs and established companies whose longtime risk aversion has cost them more than they realize. Every business leader knows that the key to growth is innovation—if you do what you’ve always done, you’ll get what you’ve always got. Deborah Perry Piscione and David Crawley argue that ultimately the key to innovation is people. After all, creativity is a uniquely human function, something that can’t be automated. So how do you design an organization so that it provides the elements that will bear new thinking and bring forth bold ideas? Through The People Equation. Based on examples from their consulting work and research into successful business practices, Perry Piscione and Crawley’s The People Equation enables leaders to create a culture where psychological safety is a given, risk-taking is embraced, and collaboration between highly competent people is nurtured. When experiments and new initiatives look promising, Perry Piscione and Crawley’s Improvisational Innovation process provides a roadmap to quickly develop ideas and bring them to market. All this requires upending the usual organizational pyramid and instilling a completely new mindset throughout the organization. Perry Piscione and Crawley show that in our rapidly changing world, the top is not where the really disruptive ideas are going to come from. And if people are afraid to take chances, even fail, you’re never going to get those ideas—playing it safe means you’ll be out of the game. The People Equation provides you with a formula for exponentially increasing out-of-the-box thinking in your organization and multiplying your chances for greater growth and success. "Deborah, thank you for speaking to our global leads, and it was by far, the most valuable insights into Silicon Valley, innovation and the region's economic prowess." "Thank you so much for your excellent presentation. I tremendously enjoyed the way you presented: clear, to the point and in a very energetic way. Thanks again for a truly engaging performance and for coming the long way!" "In her presentation, Deborah drilled down for us what it is going to take to create risk-taking cultures and what organizations are going to need in order to succeed in this economy." "One of the best speakers we've encountered in innovation process. It was Deborah's talk that made us transform our global innovation team and practices." "Deborah was all that we expected. Her unique vision of innovation and leadership is exactly what the World Business Forum needed." "We brought in Deborah to speak to 100 manufacturing CEOs as part of our innovation series, and her lessons were a hit. Without a doubt, we are bringing her back." "I could not be happier with the choice to have her come to our event. She really impressed me and it was the general consensus among our students that she really stood her ground and represented women very well. She was so pleasant to work with and was so readily able to accommodate us. She truly shined." "Deborah was a great asset to our client event. She connected with our audience immediately, took questions and spent time with many of the members afterward. She took considerable time to learn about the company and its audience, making the content as relevant as possible. This proved extremely valuable in her presentation the day of the event." "We so enjoyed having you as our speaker. Great comments are still coming in!" We know we need to change mindsets within our organization...but HOW? Deborah Perry Piscione is an authority on how leaders are changing the mindsets of their companies and driving unprecedented innovation and growth as a result. Her intriguing work stems from the stark differences between old-school power and new school leadership. Having worked as an insider at the White House and Capitol Hill, and then moving into the center of Silicon Valley, Deborah was struck by the vast differences in mindsets between the two coasts. She became fascinated by the collaborative cultures of innovation that dominate the Silicon Valley region, especially the voracious appetite for growing value from ideas. Provocative and wonderfully entertaining, Deborah's presentations are a prerequisite for leaders looking to shake the status quo. Her clients include Google, McKinsey, TED Talks, Cadence Design, London School of Economics, Microsoft, McDonald's, WOBI/HSM, NetApp, Princeton University, KPMG, Innotown, Qualcomm, Society for Human Resource Management, Stanford University, Accenture, Texas Economic Development Council, Singularity University Council on Foreign Relations, and many others.